Google Shopping Express: The company is giving six months of free same-day delivery to new sign-ups in New York and California. You can get six months of this for free, starting today. 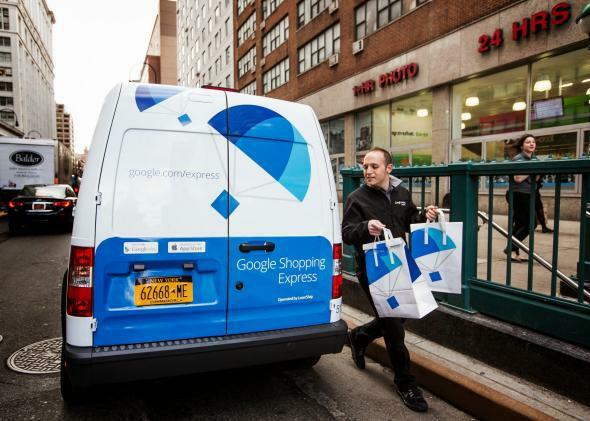 Google on Monday announced a brilliant bit of marketing for its same-day delivery service, Google Shopping Express. The service, which launched in the San Francisco Bay Area last year, is rolling out to consumers in Manhattan and West Los Angeles. As part of a promotional package, Google is promising new sign-ups six months of free unlimited delivery. Participating stores in Manhattan include Costco, Walgreens, Target, and Fairway Market, which alone are enough to revolutionize your regular shopping routine. If you join today, Google will also give you a $10 shopping credit (good until midnight) that can be redeemed on your first purchase. It sounds great, and it is. In fact, it’s almost exactly as great as starting college and discovering that your school-provided email address allows you to sign up for Amazon Student (a training-wheels version of Amazon Prime) and get six months of free two-day shipping on millions of items, plus a $10 credit for each friend you refer. I’m guessing those deals aren’t structured so similarly simply by coincidence. Amazon Student has proven an effective tool for recruiting young shoppers in their first years away from home, and signing up new customers is crucial for Google Shopping Express if it wants to become a real competitor to the Prime service. It’s unclear how much six months of free delivery on Shopping Express will cost, but Google has gobs of money sitting around to do things just like this. The service is also guaranteed to get a good deal of free advertising between social buzz and the fleet of Google Shopping Express-uniformed couriers riding around Manhattan, L.A., and San Francisco in their Google Shopping Express-branded vehicles. After the six months of promotional free service expire, Google will reportedly charge a flat delivery fee of $4.99 per store in each metro area. Amazon offers same-day shipping in 12 cities across the country, charging a flat $5.99 per order to Amazon Prime members and $9.98 on the first item plus $0.99 for each additional one to everyone else. And while I’m drawing comparisons, it’s also important to remember that Google Shopping Express and Amazon Prime aren’t entirely the same. Amazon, for instance, sells some goods directly to customers from its warehouses and has a tremendous selection of items. Google doesn’t maintain warehouses and works with local stores to facilitate purchases. You can read Farhad Manjoo’s Slate piece on the future of online shopping for a fuller compare and contrast. That said, the two services are similar enough that Google’s six-months-free promotion should give Amazon pause. Six months is a long time for Google to build consumer habits and create loyal users—especially if the same-day delivery lives up to its name. People who sign up to take advantage of the free shipping deal now may well find, come October, that they like replenishing their toilet paper without needing to run to the store, or having cough drops and cold medicine delivered when they feel too sick to leave the house. Google also doesn’t plan to remind you when the six months of free service end, bolding in its terms and conditions that you “will not be notified once the promotional credit is exhausted.” And even so—after six months of Google Shopping Express, the full price might seem worth it to never have to haul heavy shopping bags home again.